Construction: Anodized aluminum enclosure or optional stainless steel enclosure. Both are CNC machined. Configuration: Probe and cable (Lengths up to 215 ft possible) All probe styles are available. Please visit the following link to view our Probe Styles. This product is shipping now; to purchase please visit the MKIIs page below. Please direct all questions and inquires to Sales@wlwalker.com or (918) 583-3109. Front & back view of our New intrinsically safe digital thermometer. 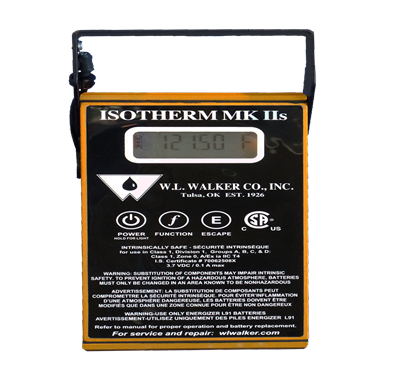 The Isotherm Mark IIs (MK2s).